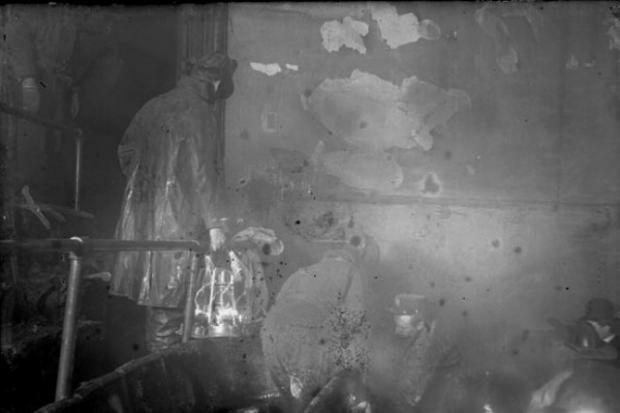 THE LOOP — Hidden away in a corner of the City Hall lobby is a bronze bas-relief tablet dedicated to the victims of the Iroquois Theater fire, which took place 113 years ago today. Chicago, of course, is a city marked by fire. One of the stars on the city flag represents the Great Chicago Fire of 1871. But today the Iroquois fire has been all but forgotten, even though it remains the worst theater fire and the worst single-building fire in U.S. history by number of deaths. In a town terrified by flames, where many survivors of the Great Chicago Fire remained alive in 1903, the Iroquois was built to be "fireproof," boasting an asbestos theater curtain and abundant exits. But much like the "unsinkable" Titanic on its maiden voyage nine years later, the Iroquois produced a tragedy just five weeks after opening, when an overhead stage light caught fire. The asbestos curtain proved ineffective — if it was ever asbestos at all — and many of the fleeing theatergoers were trapped inside by doors barred to keep those without tickets locked out. 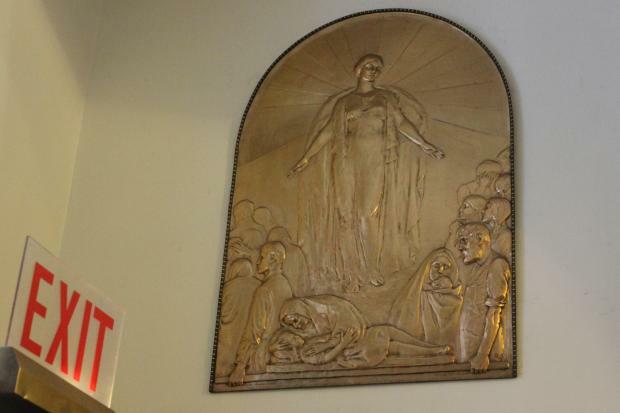 Lorado Taft's bronze bas-relief tablet commemorating the Iroquois Theater fire is tucked away in a corner of the City Hall lobby above a revolving door. More than 600 people — commonly cited as 605 — died in the fire during a matinee performance of "Mr. Bluebeard" starring Eddie Foy (now probably best remembered as George M. Cohan's foil in "Yankee Doodle Dandy"). The theater's capacity was said to be 1,600, but attendance was supposedly swelled to 2,000 by kids out of school for the holidays — it was also bitterly cold, much like the current weather — and there were an additional 400 performers and staff backstage. The building was razed in the '20s and rebuilt as the Oriental Theater, which retained the facade. Today it remains a popular theater destination at 24 W. Randolph St. It's also a popular destination for the city's so-called ghost hunters, as the alley behind it is said to be haunted and is known as "Death Alley," the enduring product of a contemporary newspaper headline that called it "The Alley of Death and Mutilation." It's also said to be haunted by "ghouls" who plundered the bodies and took on false identities to claim money and jewelry left behind by the dead. "Any concentration of so many deaths on a site like that, obviously, the place itself is going to be haunted by the tragedy," said David Cowan, of the Chicago Hauntings tour group and author of the books "To Sleep With the Angels" and "Great Chicago Fires." "I've been back there many times," Cowan said of the alley. "When I'm back there doing stuff, I'm just kinda doing my thing. People who are more sensitive to it are probably people who've never been back there before, but you can definitely feel a presence back there." Ken Melvoin-Berg, co-owner of Weird Chicago tours, agreed the site is haunted. In fact, he said he and his tour groups get more incidents of "activity" there than at almost any other site in the city. "Not all of the places that we talk about that are reputedly haunted do we believe actually are, but this is one of the places that I think is," Melvoin-Berg said. He said he's conducted "investigations" inside and outside of the theater, and "there's some definite activity going on." By "activity," he said, he means "photographic anomalies" such as "ghostlike" images on photos taken in the alley and "shadow people" in the theater proper. "I've actually seen what appears to be almost like an apparition as real as you or I wandering around the alleyway," Melvoin-Berg said. Actress and former "Saturday Night Live" trouper Ana Gasteyer appeared on the cable Biography Channel's "Celebrity Ghost Stories" saying she'd experienced haunting moments in the theater while performing as Elphaba in "Wicked," but she later told The Onion's A.V. Club: "I actually sort of had a story that I, uh, decided to augment for cash." 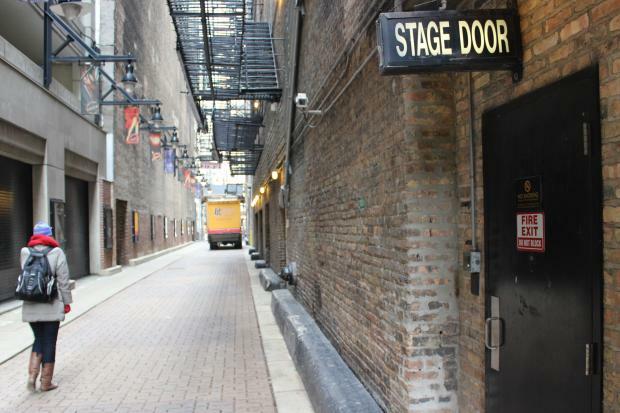 The alley behind the Oriental Theater, formerly the Iroquois Theater, is known as Death Alley. Taft was Chicago's grandest sculptor, known for his Beaux Art works such as the "Fountain of the Great Lakes" now outside the Art Institute and "Fountain of Time" on the University of Chicago Midway. He was commissioned by the Union League Club to do a memorial sculpture, and his bas-relief tablet was initially placed at the Iroquois Memorial Hospital. But it was lost after the hospital closed, and found later inexplicably in the basement of City Hall. It is now above the revolving doors in the northwest corner of the City Hall lobby — unseen and unnoticed by all except those who go looking for it. There is, of course, a Facebook page dealing in the stories of victims and survivors, as well as other disastrous details. Melvoin-Berg said in any case the ghosts he's noticed don't seem to have an abiding sense for the calendar and anniversaries, adding, "This is probably terrible for business, but I've never seen them active on a particular date." Nelson Algren recreated the experience of being in a burning theater in his 1939 poem "Program for Appeasement" (widely read as a communist allegory as well). It addresses the breakdown of safety conventions as panic spreads, stating: "Then jump, do not run, every man for himself/Get down from the balcony on someone else's head/Pick up two burning seat-cushions and burn your way out ... To that farthest exit of the deepest corner of that last unlit exit/That all the rest forgot./But never look back/Never look back/O never look back."